This bundle includes one bottle of 2 oz (57 g) Avalon Organics Hand and Body Lotion, 2 fl oz (59 ml) Avalon Organics Shampoo, and 2 fl oz (59 ml) Avalon Organics Conditioner. About Lotion * New * More Sustainable * No Parabens, Harsh Preservatives, Synthetic Colors or Fragrances, Phthalates or Harmful Sulfates * 100% Vegetarian Ingredients * No Animal Testing * Lavender Essential Oil, Aloe, Vitamin E, plant lipids and the rich oat nutrition of Beta-Glucan deliver advanced moisture relief and vital nourishment to extra dry skin. * Hand and Body Lotion with Lavender Essential Oil rebalance and restore your skin. Plant lipids and oils naturally restore your skin's lipid balance, so even extra dry, undernourished skin is replenished with long-lasting, easily absorbed moisturization. Rejuvenated at the cellular level with nourishing Lavender Essential Oil and Beta-Glucan, skin is instantly soft and silky. About Shampoo * No Parabens, Harsh Preservatives, Synthetic Colors or Fragrances, Phthalates, Sodium Lauryl or Laureth Sulfates * 100% Vegetarian Ingredients * No Animal Testing * Lavender Essential Oil, Wheat Protein, Aloe and Vitamins nourish and moisturize normal to dry hair for soft, smooth, shiny results. About Conditioner * Contains 70% Organic Content * No Parabens, Harsh Preservatives, Synthetic Colors or Fragrances, Phthalates, Sodium Lauryl or Laureth Sulfate * 100% Vegetarian Ingredients * No Animal Testing * Lavender Essential Oil, Wheat Protein, Aloe and Vitamins nourish and moisturize normal to dry hair for soft, smooth, shiny results. * NSF - Contains Organic Ingredients - Contains 70% Organic Content - Safe, Effective, Certified, Natural Body Care or Hair Care Without Synthetic Fragrances, Phthalates, Harsh Sulfates or Parabens. * Certified by QAI to NSF/ANSI 305, the American National Standard for personal care products containing organic ingredients. This bundle includes one bottle of 2 oz (57 g) Avalon Organics Hand and Body Lotion, 2 fl oz (59 ml) Avalon Organics Shampoo, and 2 fl oz (59 ml) Avalon Organics Conditioner. Hand and Body Lotion with Lavender Essential Oil rebalance and restore your skin. Plant lipids and oils restore skin's lipid balance, so undernourished skin is replenished with moisturization. 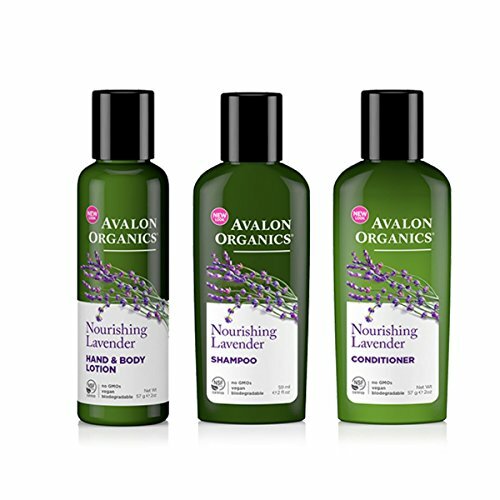 Avalon Organics Shampoo and conditioner contain Lavender Essential Oil, Wheat Protein, Aloe and Vitamins to nourish and moisturize normal to dry hair for soft, smooth, shiny results. Contains 70% Organic Content - Safe, Effective, Certified, Natural Body Care or Hair Care Without Synthetic Fragrances, Phthalates, Harsh Sulfates or Parabens. View More In Body Mud. If you have any questions about this product by Avalon Organics, contact us by completing and submitting the form below. If you are looking for a specif part number, please include it with your message. Guam Beauty Mud Anticellulite Treatment Professional Pack 1 Kilo/35 Oz.